Castor Challenge Part 7 COMING SOON! - Hairlicious Inc.
Castor Challenge Part 7 COMING SOON! July 28th, 2012 is the official date the Castor Oil Challenge will be returning to Hairlista Inc. I'm excited as it is the first Castor oil Challenge for 2012. The challenge will last for 3 months with a grand prize at the end for those who retained the most length and/or achieved the most thickness in their hair. Take 'before' pictures as soon as possible. 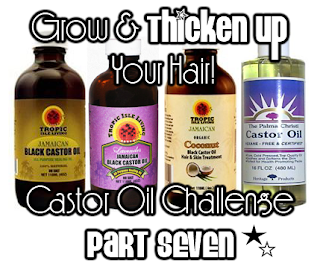 Come join the Castor Oil Challenge alongside me and my fellow Hairlistas.